This DVD is for horse lovers who want to become a better rider for their horses. In a smooth and easy way you will develop a body in full control and balance without stiffness and ache. Your riding will be improved and become more comfortable for you and especially for your horse. The training is built on basic Pilates exercises and when performed in this way it releases tensions in the muscles and makes it possible for the body to come into balance. You will get a strong body with full body control and at the same time a relaxed and focused mind. Pilates instructor Charlotte Almö has more than 30 years experience in the saddle, several years of experience as instructor and she also has a University Diploma in Equine Studies with special interest in the rider’s seat. or fill in the form below. Press the blue bottom below to send!! 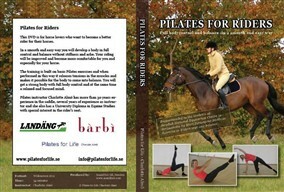 I would like to tell you that I have watched your DVD Pilates for Riders that I bought some time ago. Good intiative! The DVD is really nice and well made with good exercises. I will definitely recommend it to the students at Swedish National Equestrian Centre in Strömsholm .